A long, long time ago, Ryan Gosling left the comforts of his native Canada, came to Hollywood, and stawted tawkin’ like dis. It’s been wonderful to witness. The only thing is, sometimes the accent makes more sense than others. As a blue-collar screw-up with heart in Blue Valentine? Yes, absolutely. As a mysterious, doomed loner that knows his way around a face-stomp in Drive? Sure, sure. As a whiz-kid political campaign aide in Ides of March? Ehh, not so much. I’m glad to announce, however, that his next project fits the accent like a glove. 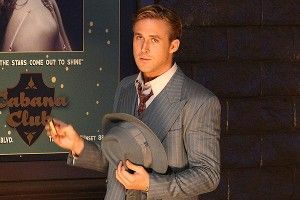 Gangster Squad — loosely based on the LAPD’s battles with the mob in the first half of last century — features Gosling as one of the rebel police officers, working for top cop Josh Brolin, targeting top bad guy Sean Penn, and seducing top dime piece Emma Stone. A hyped-up period-piece crime flick (one that happens to be directed by Ruben Fleischer, who made the super-fun Zombieland)? Yes, Ryan, now is the time to talk like dis.